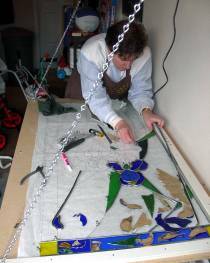 Ten years ago I took my first stained glass class from Eberhart Studio in Issaquah. I loved it! I made a Victorian panel using the lead came method, and a hot air balloon sun catcher using the copper foil method. Due to the expense of the tools and the birth of our first child, I started slowly. I made a couple of mosaic stepping stones, had a second child, and was finally able to purchase some of the more expensive pieces of equipment that I needed. 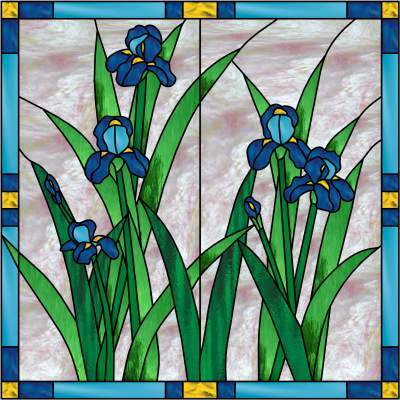 My first goal was a 46" x 46" panel in our bathroom, with an iris pattern. I created the pattern myself the old fashioned way, with pencil and lots of erasers on a couple of pieces of butcher paper. It was slow and tedious; I wish I had had Glass Eye 2000 at the time! 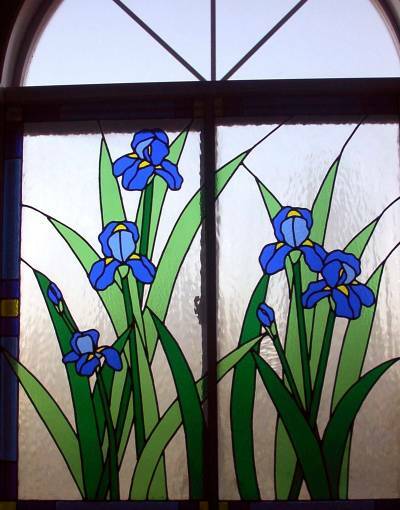 This was my first design, and only the third stained glass panel I had made. I made it in two pieces, mostly during children's naps. I was afraid that I would finish the first half and might not want to do the second half, even though I was committed. But I loved it, and finished the second half much faster than the first. It came out better than I hoped, and I was hooked. In 2006 I went to Glass Craft Expo and bought Glass Eye 2000 there. I had already turned my hobby into a small business, and had been coloring drawings with colored pencils to send to clients. Glass Eye 2000 was so amazing, and the clients love being able to tweak anything so easily, whether it's a color or moving a line. I know I can resize, copy, do anything I want. 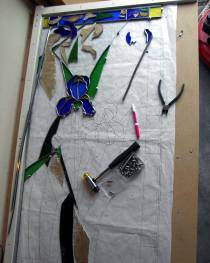 I have since put my iris panel into Glass Eye 2000 so that I could make smaller panels as gifts with just one or two flowers. My website contains photographs of other designs I have created using Glass Eye 2000. The Mt. Rainier panel is the largest one I have done so far. I needed something to go in my kitchen window that faces a street, but I still wanted lots of light. We live in Seattle, so I decided to make my own view of Mt. Rainier. I loved using Glass Eye 2000 to design this. I worked very hard on the mountain, using a picture as a guideline, and trying many different color combinations. Being able to switch colors so easily was a huge help. Then I would turn the color off and zoom in and double check the "doability" of all the pieces. The tulips in the corners made me happy, and I dream about resting on that bench! I've been inspired by the more complex designs I have seen, and usually try to add a few touches of my own. If you're going to do a big panel, go all the way! In the end I decided to make two vertical panels, which was a piece of cake using Glass Eye 2000. As I have grown in the art of stained glass, I find more and more possibilities. The textures and colors of glass capture the eye, and draw people in to the details I enjoy the process of determining size, shape, content, and color. I love choosing the right glass to make the finished product elegant and beautiful, fitting the room where it will be displayed and the person I am making it for. It is very satisfying to finish a panel, clean it all up and watch it sparkle! Jennifer Howard is a mostly stay-at-home mom who loves to do stained glass. She has a degree in Electrical Engineering, and chose to stay home once she had children. She started a small business, Color My View Stained Glass, and does commissions and projects for friends. She especially enjoys creating custom pieces. Some of her work is on display at Prized Possessions in Lakeland Hills in Auburn, Washington. In May 2005 Jennifer was selected to be the featured artist at the Covington City Hall. Jennifer can be reached by email.